In the recently concluded Facebook f8 developer conference, Mark Zuckerberg (the company's CEO) showed the Live Feed on Facebook and also made the feature live on almost all user profiles worldwide. Well, to be frank I do not like this feature. I like Facebook because it offers me with a clutter free interface to connect with my friends but with the Live Feed all I see is clutter everywhere on the site. 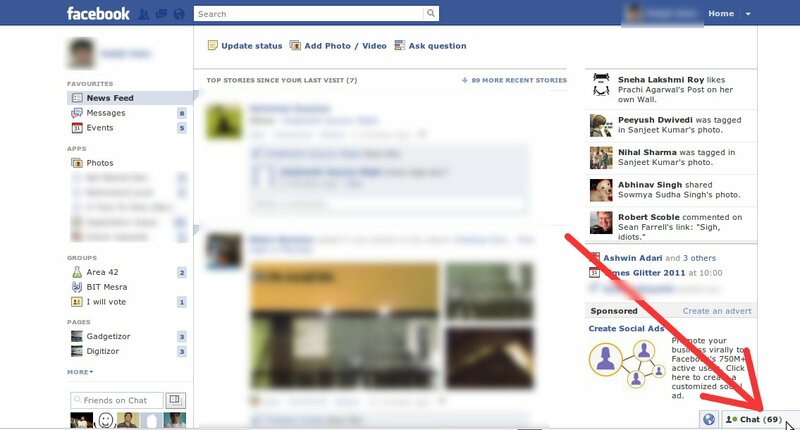 If you feel the same and are looking for a way to get rid of the Live Feed on Facebook then here is how you do it. In the screenshot shown below, click the small arrow like button at the right-most bottom as marked by the red arrow in the screenshot. Once you click that button, the sidebar including the live feed will disappear.